Patients’ pocketbooks benefit when hospitals take simple steps to prevent Big Pharma from swaying what gets scribbled on doctors’ prescription pads: Just by curbing drug sales people’s free access to hawk their wares, teaching hospitals have found that their doctors tended to order fewer promoted brand-name drugs and instead prescribed less costly, more generic versions, research shows. The study, published in the Journal of the American Medical Association, was based on an analysis of more than 1 million scripts by more than 2,000 MDs at 19 academic medical centers, comparing their prescribing to almost 25,000 control physicians elsewhere. 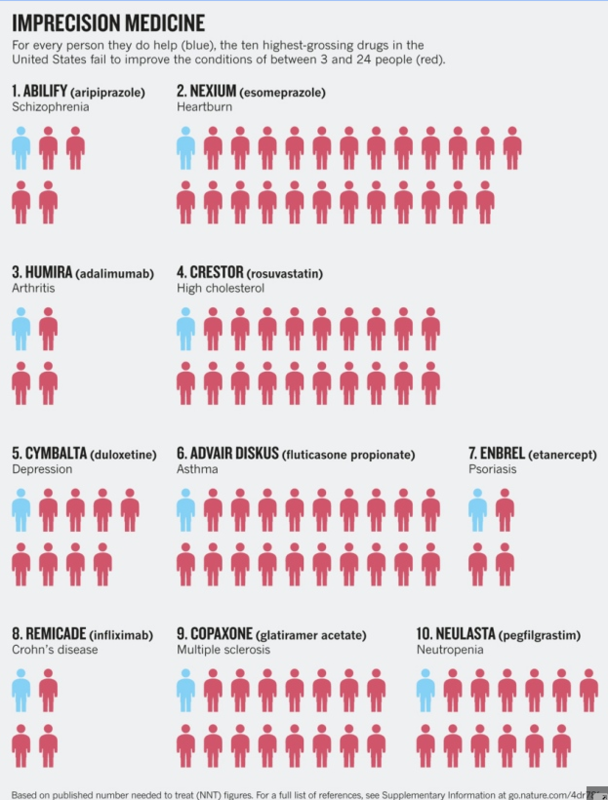 Researchers looked at records on 262 drugs in eight classes in a period from 2006 and 2012. Where teaching hospitals—under pressure from patient-consumers and pricing lawsuits—had put in place policies to rein in Big Pharma’s high pressure selling, including with meals and gifts, doctors reduced their prescribing of pricey brand-name drugs, the researchers found. Policies to limit Big Pharma marketing, also known as “detailing,” give patient-consumers a fairer shot with trying to reduce ever-increasing drug costs, especially considering that half of all physicians, under mandated reporting, say they took some kind of payment from drug or medical devices makers. Big Pharma forked over to MDs payments, including speaking fees, gifts, meals, and more, exceeding $2.4 billion in 2015. Hospitals, doctors, and news organizations like the Pulitzer Prize-winning investigative site Pro Publica deserve credit, too, for seeking to increase the transparency and ease of access to information about Big Pharma’s payments to doctors. That said, another newly published study surely will add to most patients’ already high levels of aggravation with Big Pharma and physician prescribing practices. A study published in BMJ, a leading British medical journal, “raises concerns” about the huge sums Big Pharma spends to promote drugs that may lack value in patient care. Compared with top selling and top prescribed drugs, the most aggressively promoted drugs in the US are less innovative, rated less favorably … and are less likely to be recognized as first-line treatments … and [to be] available as a generic. … [Our research suggests] that top selling and top prescribed drugs, not top promoted drugs, were more likely to represent the ideal drug that is effective, safe, affordable, novel, and represents a genuine advance in treating a disease. Those recommendations sound like a good start to me. I see in my practice not only the huge harms that patients can suffer from dangerous drugs but also the staggering economic hardship that soaring medication costs can inflict. Drug prices continue to rise in this country, becoming a leading cause of the steady increases in the costs of medical care. I’ve written how sad and ludicrous it can be that your doctor can be swayed in his prescription decisions for as little as $20—the price of a pizza and a beer with a buddy-seeming drug salesman. Hospitals and doctors need to step up and take responsibility themselves for focusing on their patients first—and putting Big Pharma’s profit-seeking venality in its proper place. Patients, too, need to stop their near worship of medications. 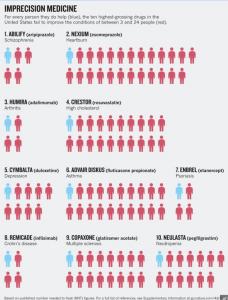 It’s worth looking at a visualization from a 2015 study that shows well how the top 10 grossing drugs work—and don’t—for patient-consumers based on their evidence-based Number Needed to Treat or NNT. I’ve written about this invaluable single score, and how it quickly can inform medical care decisions. The NNT shows, in a nutshell, how many people need to take a drug or undergo a therapy before one patients is helped, with higher numbers indicating that patients and clinicians really ought to look at the effectiveness of a given procedure or medication, especially in coordination with cost considerations.